Which Genealogy Apps Are Right for You? 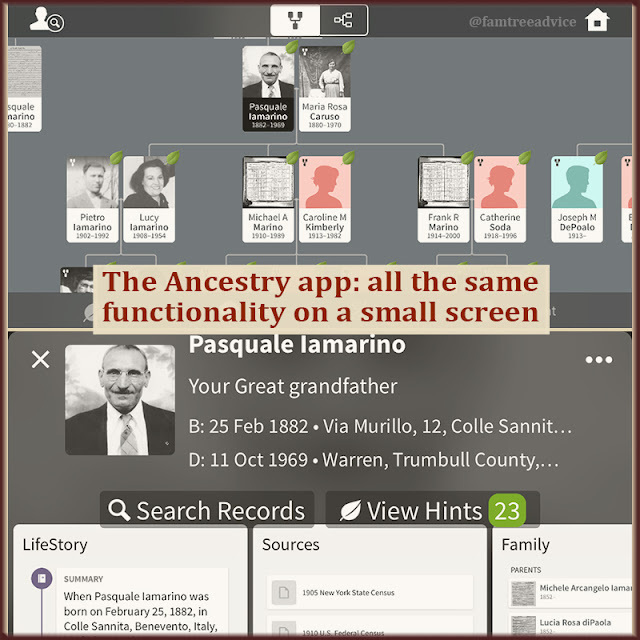 With the right apps, that computer in your pocket can be the ultimate genealogy tool. The first time I went on a genealogy research trip, I brought a stack of papers and a notebook. I couldn't bring my family tree with me. I wouldn't dare bring my expensive laptop computer on the New York City subway! That was before I had the computer-in-my-pocket we call an iPhone. With the abundance of free apps for iOS and Android cellphones, there's no reason you can't take it with you. Say you're visiting a cousin who's never seen a photo of your shared great grandmother. Pull out your phone, open your tree, and there's great grandma. Then you cousin takes out her collection of family wedding portraits. Pull out your phone, open your scanner app, and take a digital copy of the photos with you. 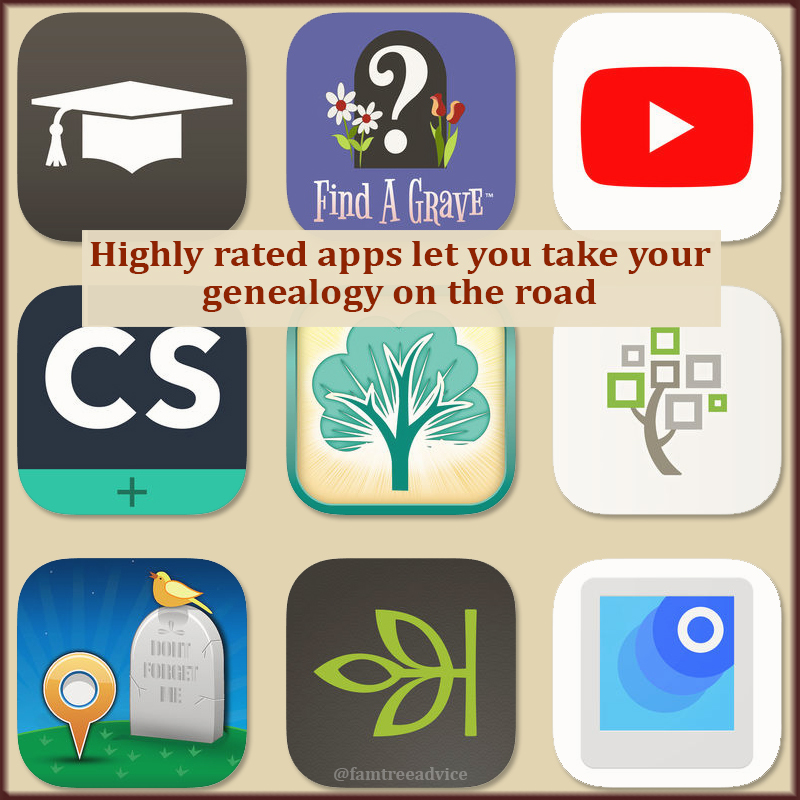 Here are some of the top-of-the-line genealogy apps for you to try. They're all free. Only the Ancestry and Ancestry Academy apps require an Ancestry.com login. Whichever genealogy websites you like to use, there's an app for that. These apps deliver your web-based family tree in a mobile-friendly format. Choose the app that applies to you. My tree is on Ancestry.com, so I have the Ancestry app. You'll have access to everyone in your tree with every fact and document you've attached to them. It's ideal for taking your entire tree with you, in your pocket. I had my tree loaded in the Ancestry app before I went to a family wake recently. With the tree loaded, there was no waiting and no data usage. I had it ready when distant cousins were curious about everyone's relationship. Two views of my family tree in the Ancestry app. You can use cemetery apps in two main ways. First, imagine you're in a cemetery where you think your ancestor is buried. But you don't know which section or row they're in. You might find that information in a cemetery app. Next, imagine you're in a generous mood on a nice day. You want to snap some photos in a cemetery and upload them for relatives to find. You can see which photos people need, and if a grave has been photographed already. 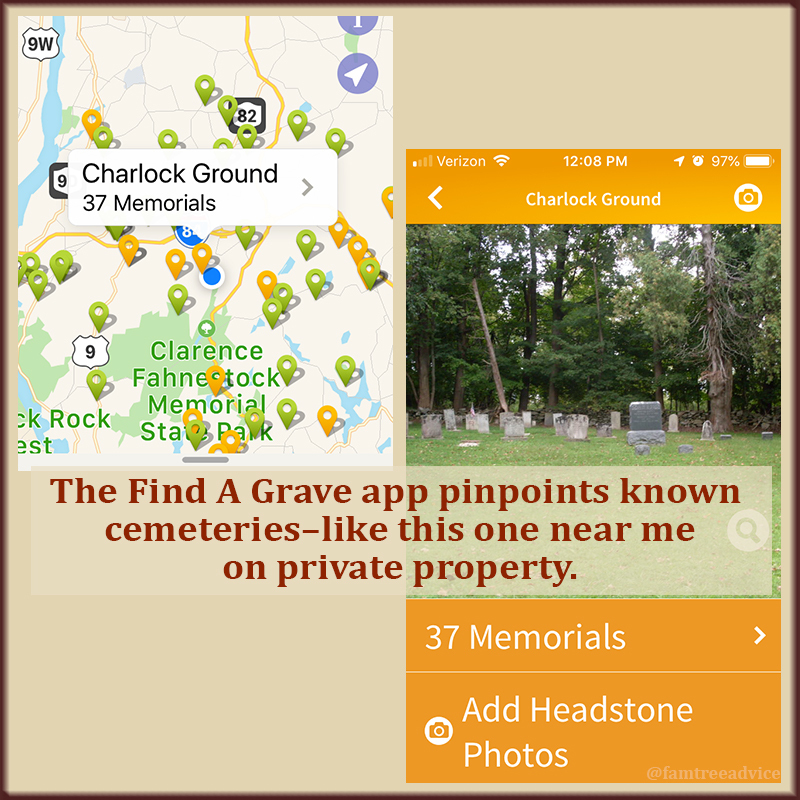 The Find A Grave app shows you where the closest cemeteries are. How many times has someone taken a cellphone picture of a photograph in a frame and sent it to you? You're grateful, but the photo is crooked, the frame is leaning backwards, and the faces look distorted. Don't do this to someone you love. You can avoid taking crooked photos. With Cam Scanner, I've photographed a wrinkled, discolored sheet of paper and output a clean, perfect image. These apps are smart enough to find the edges and make intelligent corrections. There's always more to learn about genealogy. There are new perspectives, great advice, and step-by-step procedures. For Ancestry.com subscribers, Ancestry Academy videos are free. Watch them wherever and whenever it's convenient for you. Brush up on the basics of genealogy research, or try out a new method for analyzing your DNA results. If you don't subscribe to Ancestry, fear not. The Ancestry channel on YouTube is free. It offers tons of inspirational, helpful, and eye-opening content. I enjoy watching videos from Crista Cowan, aka the Barefoot Genealogist. She works for Ancestry, but her focus is on genealogy. So don't ignore their channel if you don't use Ancestry.com. You'll find YouTube channels for MyHeritage, FamilyTreeDNA, FamilySearch, experts like Amy Johnson Crow, and many more. When you find a channel you like, subscribe to it. It's like putting something in your Favorites list. Now you'll find those videos more easily. Watching genealogy videos keeps your head in the game when you're on the train, having lunch at your desk, or waiting at the doctor's office. Genealogy doesn't have to keep you tied to your desk. Take it out into the world and share your family tree. I want to see you here again! Follow me on Twitter or Facebook and know the moment a new article comes out. How can you find and fix genealogy inconsistencies? And which style should you choose? Read on. Have you always recorded facts in your family tree in the same way? Or did you do it one way when you first started, and figure out a better way later? Being consistent is important to the long-term future of your precious genealogy research. If you leave behind an inconsistent family tree, your work will cause more questions than answers. It can be hard to stick to a format when you can't work on your tree that often. Make some style decisions now, and you can continue creating your lasting legacy. Recording a deceased relative's Social Security Number can be helpful. Say you find a document for a person with the same name, but a different SSN. That number can prove a document does or doesn't belong to your relative. I wasn't consistent when I started this hobby. Sometimes I used the SOCIAL SECURITY NUMBER fact in Family Tree Maker, and sometimes I used the SSN ISSUED fact. But the SOCIAL SECURITY NUMBER fact makes more sense. You can record the number as well as the date and place where it was issued. deleted the SSN ISSUED fact. The first records I collected for my family tree were ship manifests. Nearly every one of my ancestors passed through Ellis Island. Recording all these immigration facts is very important to my family history. At first I used only the IMMIGRATION fact type, recording the date and place of arrival with a note about the ship name. Then I realized I could record the date they left Italy, too. That's written on the manifest. Return trips, like visiting the old country to see your parents or bring back the rest of your family. I made my choice and updated my fact types. I added in the missing emigrations or departures, too. If you're using a decent family tree program, you can select how you want to display these types of facts. 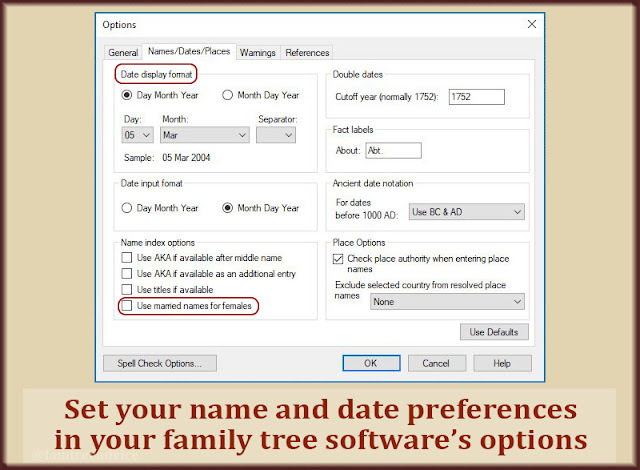 Your family tree software should give you the option to choose how to present your data. Some genealogists choose to display everyone's last name in all capital letters. I don't want to do that because I have many names that begin with a small letter, like deBellis. I don't want to lose sight of that. which name do you use for a woman who married more than once? The last name that relates to you, or the final husband's name, even if he's nothing to you? Working for an international company made me aware of writing simply and clearly. Avoid local phrases and use international dates. In the United States we're used to the Month/Day/Year format (12/28/2018). But some countries use the Day/Month/Year format (28/12/2018). Others prefer Year/Month/Day (2018/12/28). Think of how many dates can be misunderstood by someone in another country. Is 5/4/2019 May 4th or April 5th? It depends on where you live. To avoid confusion in my family tree, I use DD Mon YYYY, as in 28 Dec 2018. Any English-language speaker will understand this, and many Romance-language speakers will understand it, too. Their month names aren't so different from ours. For a long time I wouldn't let Family Tree Maker "resolve" addresses or place names for me. For one thing, I thought it was silly to put "USA" at the end of a New York City address. Where else do you think New York City is? As time went by and my tree's international members outnumbered the Americans, I decided adding "USA" wasn't a bad idea. But one difference I've stuck to is county names. Leaving out the word "County" can lead to confusion. What if you have only the name of the county someone lived in, and not the town? Will that be clear? So rather than Beaver, Pennsylvania, USA, I'll enter Beaver County, Pennsylvania, USA. Whatever you decide to do, make sure it's easy for anyone to understand, and stay consistent. This free program will uncover inconsistencies in your family tree. I wanted to find these facts and change them. I discovered an option in Family Tree Maker to Manage Facts from the Edit menu. I chose a fact type, clicked Data Options and saw a list of every person using that fact type. I visited each of these people in my tree and made adjustments. The fact type OTHER turned out to be something I did because I didn't know how to characterize these facts. Each person using OTHER had been in the Japanese-American prison camps of World War II. These particular facts were the dates they were incarcerated and released. I changed each of these entries to use my custom fact type, Internment. One man named Luigi was using the RELEASED fact type. This was the date they released him from quarantine on Ellis Island. Because it was a medical quarantine, I switched to the MEDICAL CONDITION fact type. 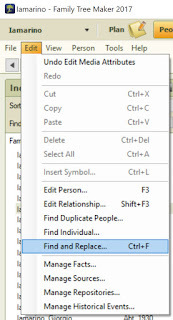 For other types of changes, you may be able to use Find and Replace within your family tree software. Be careful. Before you click OK to make a global change, think about what else might change. If you're changing a county name, is there a person with that name? Will their name change from John Sullivan to John Sullivan County? Running Family Tree Analyzer showed me a Find and Replace blunder I'd made. I messed up some Italian last names that are the same as Italian occupations. Everyone named Canonico became "canonico (member of the clergy)". Oh boy. I fixed this with some careful one-at-a-time finding and replacing. Even if you're not thinking of your genealogy hobby as your legacy, think about your own sanity. If you don't work on your tree for a while, how many of these inconsistencies will make you say, "What was I thinking?" Which Global Map is Best for Genealogists? Don't rely on one mapping tool when there are a few excellent ones. I'm the oddball who searches on Bing instead of Google. I love Bing's features (a daily image and top news stories). Plus I rack up points to swap for $5 Amazon gift cards. So I tested them side by side. I chose to explore a small island in Italy where my uncle was born. I don't know the name of the street where his family lived, but I wanted to have a look around town. When you enter a place name in both Google Maps and Bing Maps, there is a left panel with information. Both offer some quick facts about the place from Wikipedia. Google Maps offers photos, Street View or panoramic pictures. Bing Maps seems more interested in helping you travel to this destination. They offer info on places to stay and things to do. Note: Google Maps has that information, too, but it takes an extra click to get to it. When searching for places where my ancestors lived, I want clear images, street names and a street-side view. 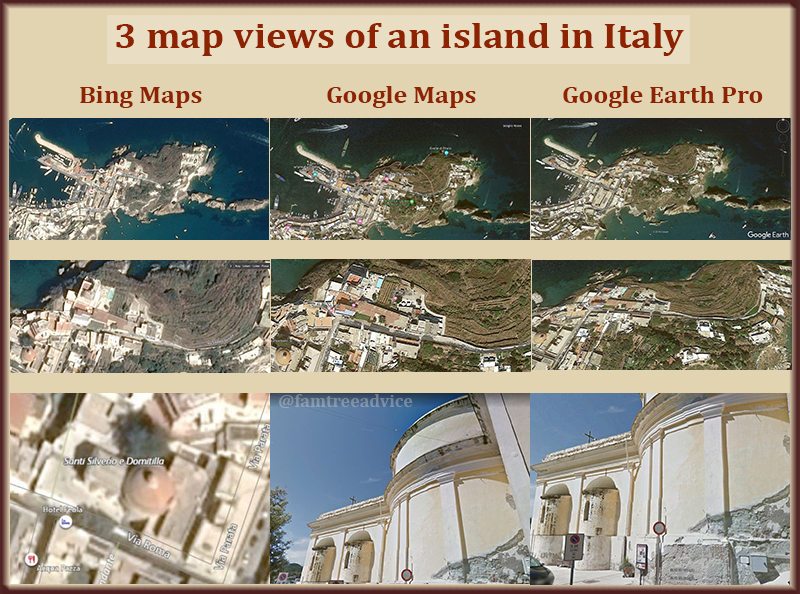 For this location, the tiny island of Ponza, Italy, Bing Maps came up way short. You can see by these side-by-side comparisons that Bing's images are not clear and it's missing some street names. Comparing Bing Maps and Google Maps side by side was eye-opening. To test the level of detail each tool can give you, I zoomed in on a church in the town. I went all the way to street level and Bing Maps was the clear loser—for this location. It could not zoom in very far on the church and street view was not available at all. Google Maps and Google Earth Pro gave me the same streetside view of the church. But Google Earth Pro also gave me the lay of the land. I did more side-by-side comparisons using 3 houses I've lived in: one in Pennsylvania and two in New York. Once again, Bing's overhead view didn't get very close to my house, and it was a bit fuzzy. Google lets me zoom in all the way until it switches to street view. Google Earth Pro also lets me get really close, and adds a more 3D quality. It may seem like a slam-dunk to you that Google Maps is the clear winner, with Google Earth Pro coming in second for its topographical view. But I always check both Google and Bing. You will find cases where an address doesn't exist in one map, but it does exist in the other. Bing has one terrific feature important to a genealogist. It shows the county name. I can put in a street address, and at the top I see "United States - PA - Bucks Co. - Upper Southampton Township." This feature is one reason why I always go to both maps. As a genealogist, you owe it to yourself to bookmark Google Maps, bookmark Bing Maps, and install Google Earth Pro. Happy virtual travels! It's always fun to create an up-to-date GEDCOM from my family tree and get the latest insights from Family Tree Analyzer. I've written about this free PC-based program several times now (see links at the bottom of this article). Today let's look at how you can use its Main Lists tab to produce an all-in-one report. First, your family tree software should have an export option. You can use the export option to create a GEDCOM. If you keep your family tree online only, and not in desktop software, you've given up some control of your family tree. 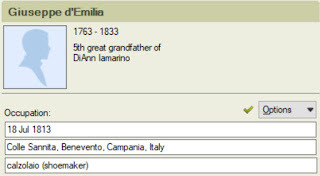 Ancestry.com lets you export a GEDCOM from your online tree, but other sites, like FamilySearch.org, do not. Now let me show you what you can do with an all-in-one report from Family Tree Analyzer. 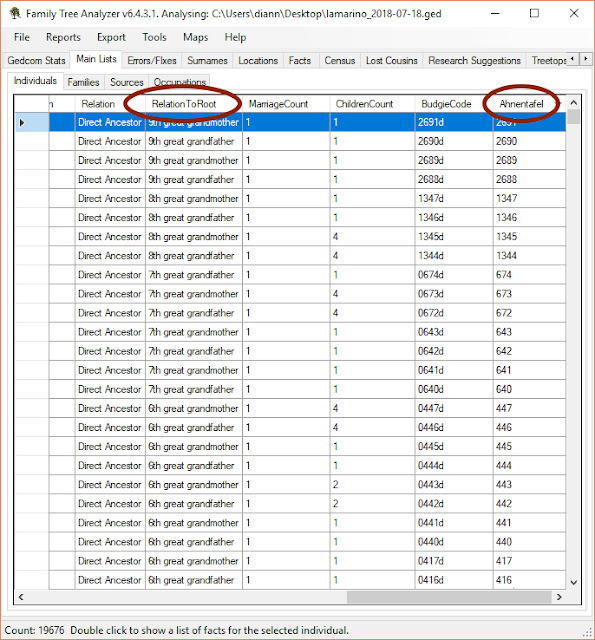 After loading your GEDCOM in Family Tree Analyzer, click Main Lists. 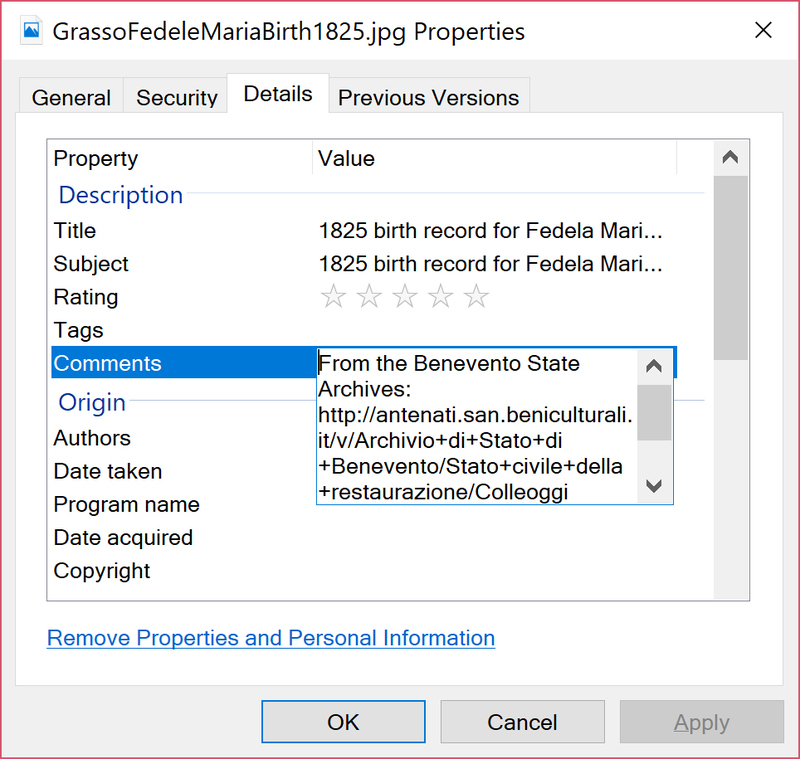 Launch Family Tree Analyzer and open your most recent GEDCOM file. The software will analyze your GEDCOM for several facts. When it's finished, click the Main Lists tab. With the Individuals tab clicked, you'll see a table containing every person and fact in your tree! Click the Export menu at the top of the program window to generate a "csv" file. This is a file you can open with any spreadsheet software, like Excel. 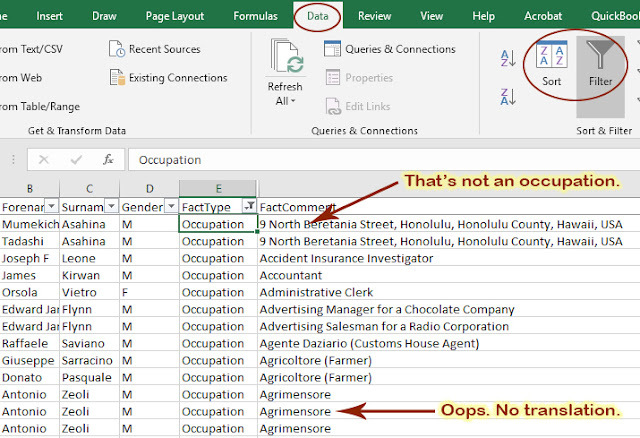 Excel gives you tools to sift, sort and manipulate the data any way you like. But I don't want to turn this into a long Excel tutorial. If you don't know how to filter and sort your contents, here's a good, short YouTube video. Jump ahead to 1:44 and watch until 2:24. Short and sweet. 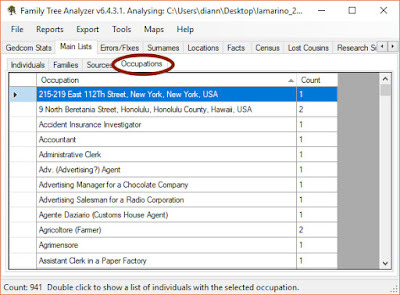 In your spreadsheet, choose a Fact Type (column E) to filter by, such as Occupation. Now click Excel's Sort button and sort by Fact Comment (column H). an alphabetical list of what you typed in for the description. 1. Fix Errors. I can scroll down the list and scan for typos. In the image below, you can see there's an address instead of an occupation. I can fix that. In my family tree software, I'll go to the person named in columns B and C. It turns out I'd entered an address for the place of work, but left out the word "dentist" for these 2 men. A filtered, sorted spreadsheet of your family tree facts simplifies a lot of tasks. 2. Complete My Job Translations. Most of my genealogy research work is in Italian documents. 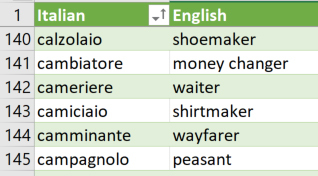 I thought it was cool to enter a person's occupation in Italian, so I made a separate translation list for my own use. 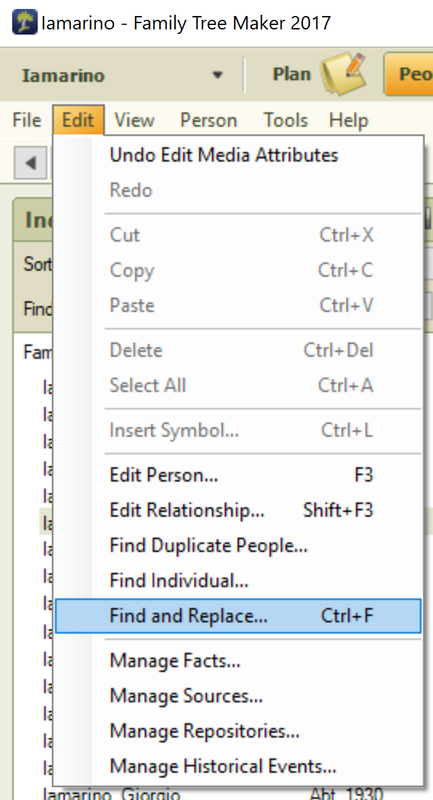 But one day I realized there's a Find and Replace function in Family Tree Maker. So now I'm including the English translation in parentheses, like this: "calzolaio (shoemaker)". 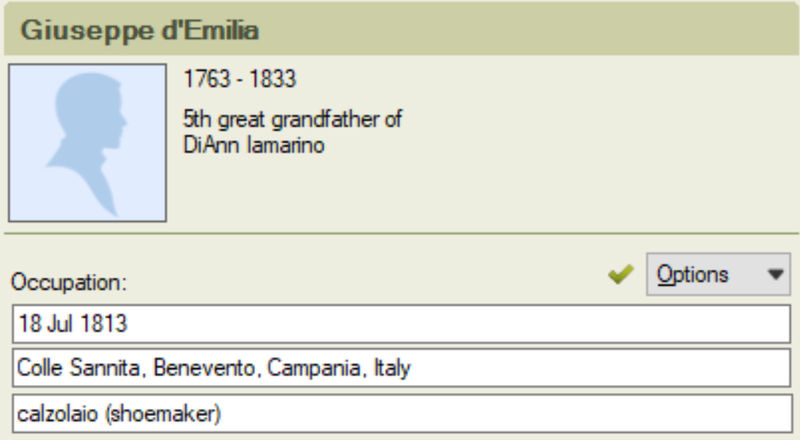 Family Tree Maker is smart enough to make suggestions as I type in a field. 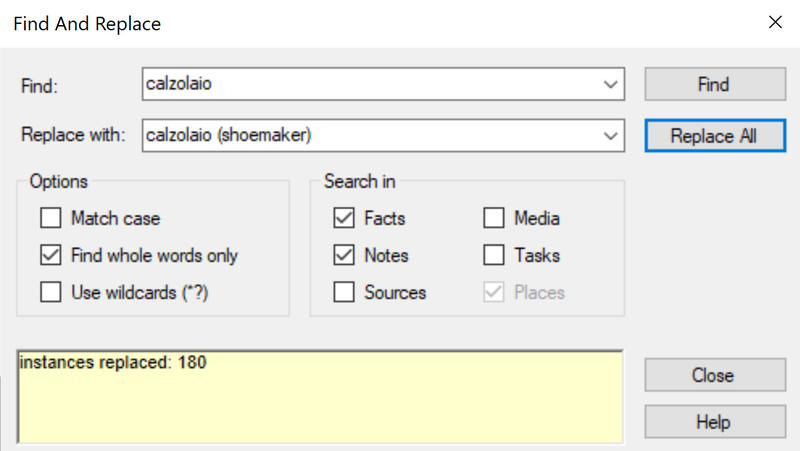 So if I type "calz", it suggests "calzolaio (shoemaker)". But I'll bet I overlooked a lot of jobs when I did my find and replace. This spreadsheet helps me find those untranslated Italian words, like agrimensore, benestante, eremite, and so on. Now I can finish this translation task and make my family tree more valuable for myself and others. Let's pick another Fact Type. Click the Filter button at the top of column E.
Click Select All to make every fact type available again. Click it again to uncheck the whole list. Now click to select the Birth fact type and click OK.
Click the Sort button and sort by Fact Location, column G.
Scroll down through the alphabetical list of all the birth locations. Do you see a lot of blank locations toward the bottom? In a recent article (see "5 Clean-up Tasks to Improve Your Family Tree"), I explained the value of having approximate birth dates and places in your tree. It can give you better hints and search results. For example, I have a man named Salvatore Martuccio who was born in about 1873. I don't want to see a hint for finding him in the 1880 census in America when he and his family were always in Italy. So I need to add Italy as his place of birth. I think I know which town he was born in, but I have no documentation. So I'll keep it loose and say he was born in Italy. This spreadsheet makes it easier to find facts—and missing facts—so I can finish my clean-up tasks. Arrived aboard the [ship name] with [wife, children, brother, etc.] to join [person's name and relationship] at [address]. "Left on the [ship name] to go to [destination city]." "Arrived with [wife, children, brother, etc.] to join [person's name and relationship] at [address]." I can use this filtered and sorted spreadsheet to find all the descriptions I want to edit in Family Tree Maker. Hurray! More work to do! I'd like you to think of this method as a way of seeing everything that's hidden from plain sight in your family tree. Work on what's important to you. No matter how much you decide to correct, improve or simplify, you'll wind up with a better, stronger, more reliable family tree. So filter, sort, and see how much you can accomplish! This one decision is my biggest genealogy time-saver. Last December I wrote my list of genealogy goals for 2018. I'm making progress, but at least 2 of my goals will spill over to next year's list. That's why I'm so happy, week after week, about my decision to back up my family tree files automatically. Well, automatically and also manually, because two backups are better than one. There are free storage options and paid storage options. I'll list several of them below, but first: Automation. 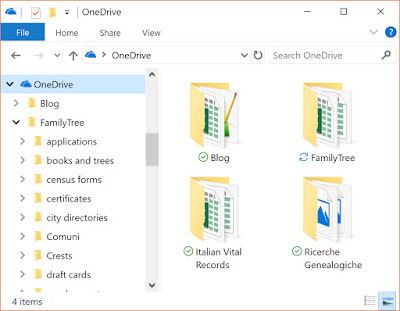 I've decided to use my Microsoft OneDrive cloud storage for my genealogy files. All my files are still stored locally on my computer. But they're mirrored and continuously backed up to OneDrive. My document tracker spreadsheet is always saved on my computer and the cloud. Each census sheet or birth record I download to add to my tree is backed up to the cloud at the same time. 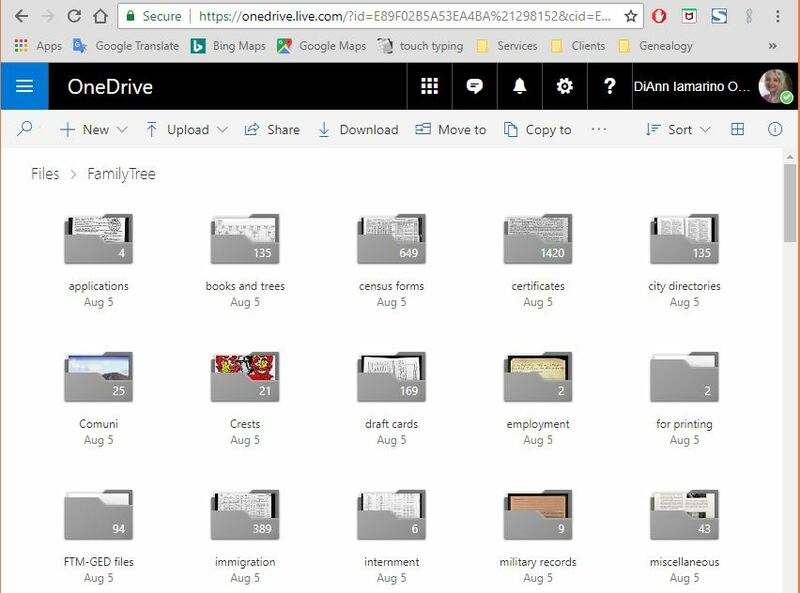 When I work in Family Tree Maker and make a backup file, the tree and the backup are also saved on my computer and the cloud. I don't have to take an extra step to back them up. But, I also have an external, 1 Terabyte drive. Once a week I look at all my genealogy folders on my computer, sorting them by date. I copy anything with a newer date than my last backup to the external drive. My OneDrive files, accessible to me online, anywhere. It's fast, efficient and safe. Plus, having your files online, in your password-protected storage area, means you can access your files from anywhere. I like syncing a portion of my computer with OneDrive because the files are still on my computer. They'd still be there even if I had no internet access. I'm a monthly subscriber to Microsoft Office 365. I need it for work, and the cost is low enough that I'll keep subscribing even after I've retired. My subscription includes 1 Terabyte of storage space. 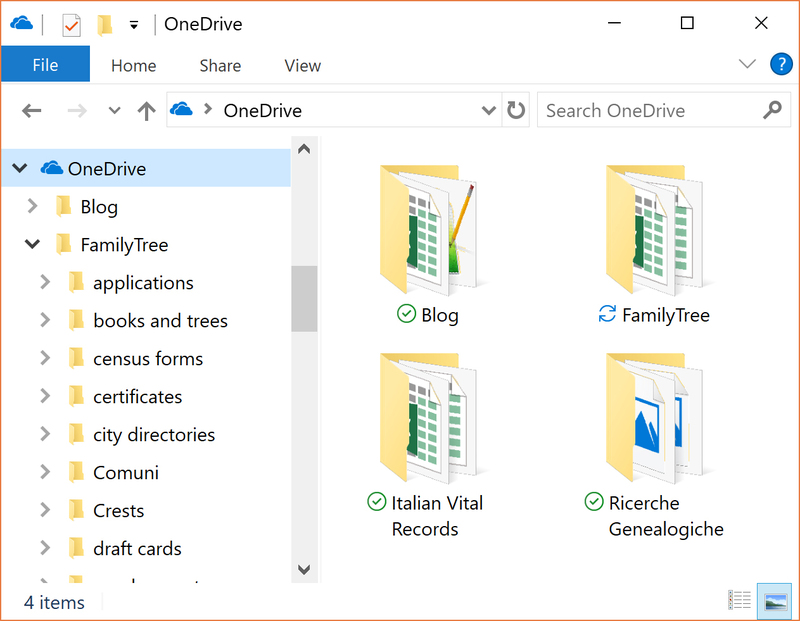 Even with all my genealogy files on OneDrive, I'm only using a tiny portion of my Terabyte—about 182 GB. You can get 5 GB of free storage space or 50 GB for $1.99/month. Visit OneDrive to learn more. You can also use your free Google account for automatic backup. Google Drive lets you synchronize folders with your online storage space automatically. It works with your Windows or Mac computer, and your Android or iOS device. Google Drive gives you 15 GB of storage for free. For $1.99/month, you can buy 100 GB of storage. Visit Google Drive to learn more. Do you have an iPhone or iPad? If so, you have 5 GB of iCloud storage. You can access it from your computer as well as your devices. That's not a lot of space, but you can pay for more storage. The cost depends on your country and how much space you want. Visit iCloud to learn more. Free storage with Dropbox is limited to 2 GB. You can buy 1 Terabyte of online storage space for $9.99/month. I like to use Dropbox for file sharing. I've posted fill-in-the-blanks census sheets there and other PDFs to share with specific people. Visit Dropbox to learn more. If you have an internet connection in your home, your service provider may offer you some free storage space. Check with your provider. You can see that the paid plans are very competitive with each other. With OneDrive, I'm basically paying for that 1 Terabyte and getting Word, Excel, PowerPoint and more for free. No excuses now. Even if you split your files among different free storage spaces, it's time for you to create your back up plan. How would you like a tool that shows you exactly which census forms you haven't found for each person in your family tree? This is a simple process of (1) open file, (2) run report, (3) work with your results. give you the best results. Enter an estimated birth date for everyone in your tree. When you don't know someone's date, make them about 25 years older than the oldest child you've found for them. There's a big difference when searching for someone born in 1850 vs. 1900. Enter a country of birth and death whenever possible. Say you've researched several generations of a family and they stayed in one area. If someone's children never emigrated, assume the person was born and died in that country. Add a note that this is not verified. Now the FTA Census Report will be much smarter and you'll need to do very little editing of your Census Report. 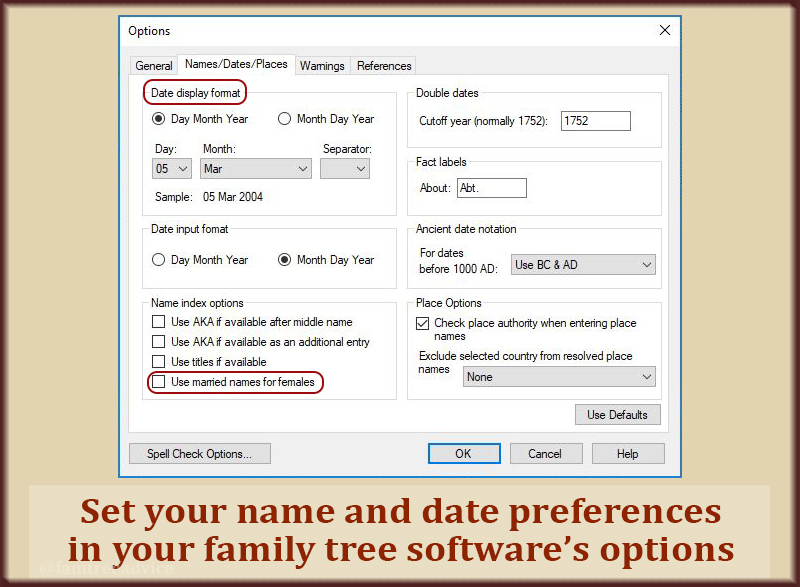 Once you install FTA, all you need is your tree's latest GEDCOM file (see the definition). Check your software's File menu for an Export option. If your tree is on Ancestry.com, but not on desktop software, go to your Tree Settings online. Find the green Export tree button. Some websites believe in one shared tree. That means you don't have full control of your tree, and you cannot download a GEDCOM. The control freak in me can't imagine going that route. Launch FTA and open your GEDCOM file. Make 2 selections and click "Show Missing from Census" to run the report. Click the Census tab at the top. Click the button labelled Show Missing from Census. Your report will open in a new window. Your report is ready to export to Excel. Notice the status line at the bottom of the report. You can double-click an entry from this report view to go to FamilySearch and find the census you're missing. FTA is smart. It knows if someone in your tree was alive and living in the right country for a particular census. By default, it doesn't search for anyone over the age of 90, but you can change that. Now that you have the report, click the Excel icon at the top of the report window. Save the file to your computer in the default CSV (Comma-Separated Values) format. Now go back to step 1 and repeat the process for each census year you need. Now it's time to work with the data. I found a small number of people who didn't belong in this report. So before you start working through people one line at a time, let's check a few things. To work with your report more easily, hide the spreadsheet columns you don't need right now. To hide a column, click the letter at the top of the column, like G. This will select the whole column. Then right-click the selected column and choose Hide from the menu. The first people I'll look for have a birth location and death location in another country. I see only a couple of people who match this description. The first one is a familiar name: Domenico Sarracino. I know he never came to America, so I can remove him from this report. Next I want to remove everyone with an unknown birth and death date. I know that in my family tree, these are most likely relatives of relatives. I might know nothing beyond their names. They shouldn't be my focus, so I'll remove them from my spreadsheet. Finally, I'll sort the entire spreadsheet by the CensusName column. Now I can scroll through the names and remove duplicates. I found about 15 people who appeared to be duplicates with the same name and birth date. One more step. For each name in the spreadsheet, I'll check their entry in my family tree. I quickly spot some more who I know never came to America. The reason FTA doesn't know they never left Italy is that my birth and death dates don't always say they were born or died in Italy. I didn't want to make that assumption, but now I think I'd better. When it's a safe assumption, I'll put in the country and add a note that this is not confirmed. Now I have a list of 120 people who need me to find them in the 1900 U.S. Federal Census. That may sound like a lot of people, but my family tree has almost 20,000 people. It's about 0.6% of my total tree. That sounds manageable. And finding those missing census forms will make my tree that much more valuable. I'm ready to begin searching for those census sheets. I'll whittle down my list as I go, keeping track of my progress. Then it's on to the census reports for 1910, 1920, 1930 and 1940. Now you're ready to make targeted searches for those missing census sheets. Family Tree Analyzer is a must-have if you want to make your family tree your legacy. Want a cheap thrill? When you're done, create a new GEDCOM and run the report again. Look at your results! 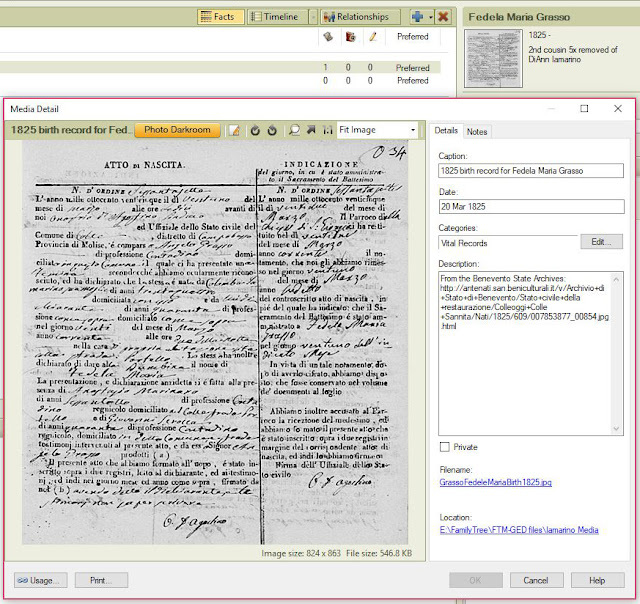 There's a new version of Family Tree Analyzer—the must-have genealogy software program from Alexander Bisset. This free program offers almost unlimited insights into your family tree. It also helps you find problems so you can fix them and fortify your family tree. I've installed it on my Windows 10 computer and imported my up-to-date GEDCOM file. Let's take FTA for a spin. This is a free genealogy toolbox. A big, big toolbox! Please visit FTA's Facebook page for announcements and help with using the program. To find the latest download link, see the FTA website. The program runs on Windows; a Mac version is currently in development. There's so much genealogy goodness to explore! Let's start with a very appealing table view of your entire database of people. Here are a few of the valuable insights you can learn from the program's Main Lists tab. On the Main Lists tab, click to sort by the Occupation column. 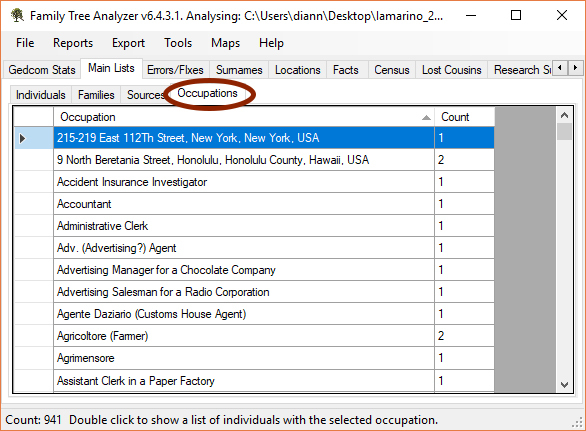 On the Main Lists tab, click the Occupation column header. I recently learned that my 2nd great grandfather was a shoemaker when he married. That's a surprise. He wasn't a shoemaker when my great grandmother was born. I wonder how many shoemakers are in my family tree. My ancestors are all from Italy, so I record shoemakers as "calzolaio (shoemaker)". If I scroll down to the letter C in the alphabetical list of Occupations, I see the TON of shoemakers in my family tree. I also see they're mostly from one town. That's a lot of shoemakers for one town, even when you consider the span of these relatives' birth years. Now you can quickly find the errors hiding in your family tree. That's nice to see, but here's something much more useful. Click the Occupations tab to see all the jobs you've entered for people in your tree. I immediately see errors in the first 2 lines. There are addresses where the job title should be. By double-clicking this bad entry, I see it's attached to a man named Vincenzo. Now I can go to Family Tree Maker to correct this error. Sure enough, I accidentally entered an address and left out his occupation. Wonderful! I can scroll through the Occupation list in FTA to find typos, untranslated Italian words, or other errors to fix. This is just the kind of "assist" we can all use. On the Main Lists tab, scroll to the right to find the Ahnentafel column. Click it once to sort by this column, then again to reverse-sort the column. Ahnentafel comes from a German word meaning "ancestor table". Each of your direct ancestors has a number in the Ahnentafel system. You are #1. After you, each man in your tree has an even number (your father is #2) and each female an odd number (your mother is #3). I asked you to reverse-sort your Ahnentafel column for the maximum "wow" factor. Your earliest direct-line ancestor will be the first person in the list. In my results I see four 9th great grandparents at the top of the list with really high numbers! 2691, 2690, 2689 and 2688. Here's an easy way to see how far you've climbed up your family tree. Notice the RelationToRoot column a few to the left of Ahnentafel. Here you'll see how many of each level of grandparent you've found. I've found a bunch of 7th and 8th great grandparents, and even more 6th great grandparents. As I scroll down the numerical list, I can also see where Ahnentafel numbers are missing. In fact (this is exciting! ), the lowest-numbered ancestor whose name I don't know is #59, one of my 3rd great grandmothers. You can use this Ahnentafel view to zero in on the missing relatives you most want to find. These are two very important insights to help you fortify your family tree. And that's only the tip of the iceberg! I'll explore some more of FTA's useful tools in upcoming articles. Even if you don't have the FTA program, I know you'll find inspiration in these articles. You owe it to yourself to try this program! My hat's off to Mr. Bisset for having written the program I could only imagine. In my last article I discussed 3 of the 6 building blocks that form my genealogy philosophy. They can be the solid foundation to your strong family tree. Let's continue. The best thing I ever did for my family tree research is start this blog. To publish twice a week, I have to be active. Researching, exploring new websites, and collaborating with others. And I do that nearly every day. That strict schedule is resulting in tons of new discoveries. It seems like every couple of weeks I find a new set of 5th or 6th great grandparents! Do whatever you can to keep a hand in your research each week. That continuity will help you focus and accomplish more. In my early days, I grabbed census documents, attached them to the head of household and moved on. After a while I had a mess on my hands! I couldn't retrace my steps to find that census sheet again. I didn't cite my source. And I still needed to add the image and the facts to everyone else in the household. Now I've gotten into an efficient routine. I follow the same steps to make sure I record and document each image and fact thoroughly. I add a title and source citation to the image's properties before dragging it into my family tree. I have a format I follow that ends with the URL where I found the image. I edit the date of the document in Family Tree Maker. I give it a category and make it the person's profile image if I don't have their photo. Let's say it's a marriage document. I add the image to one spouse, then share it so it's attached to the other spouse, too. I make note of the document in my Document Tracker. This spreadsheet shows me at a glance which documents I have (and don't have) for anyone in my family tree. Because I made it a routine, I'm now frighteningly organized. No more doubling back to try to fix my messes. Add important information to each image in your family tree file. Above, the caption and description I added to the image file itself have carried over to Family Tree Maker. I simply edit the date and select the category. This final building block applies to cuckoo-birds like me who've downloaded large document collections from FamilySearch or the Italian Antenati website. I know it will take YEARS, but I'm filling several spreadsheet pages with the facts I transcribe from those thousands of Italian vital records. It seems daunting, but being able to easily search for a particular person in a span of years is awesome. I've completely documented 6 years of birth records from my paternal grandfather's hometown and a smaller selection from the other towns. I want to own this complete collection, and I look forward to sharing it with my fellow descendants of these towns. 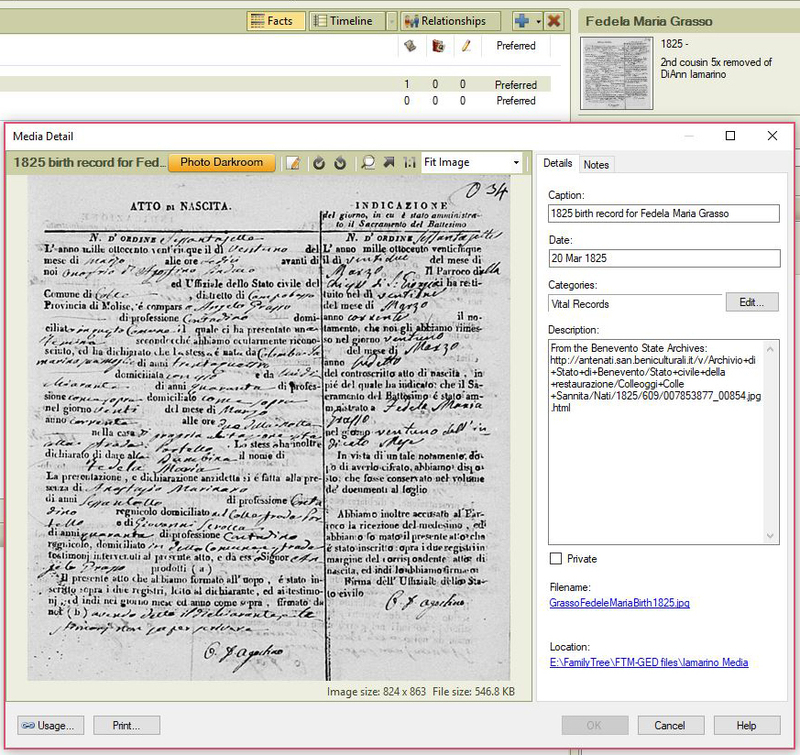 What if you inventoried the vital records, censuses, ship manifests and other images stored on your computer? How might that simplify your future searches? 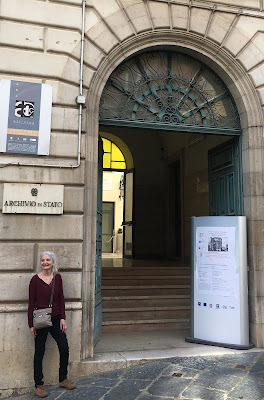 When I started writing this blog, I began thinking of my genealogy research like a job (the best job ever!). I wanted to apply all the best practices of the genealogy industry to my research. These 6 building blocks are making my family tree world class. How about you? I record occupations in my ancestor's language. Years ago I dove headfirst into transcribing Italian vital records for my family tree. I visited a Family History Center, viewed the microfilm, and typed into my laptop. I memorized the Italian words for numbers, months and family members. 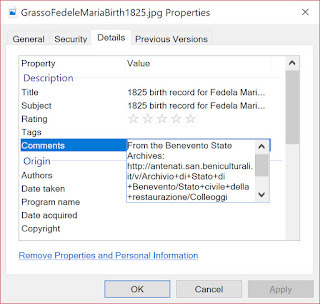 When a document included a person's occupation, I typed the Italian word and kept going. I didn't translate the words on the spot, but later I created a file of Italian occupations and their English definitions. 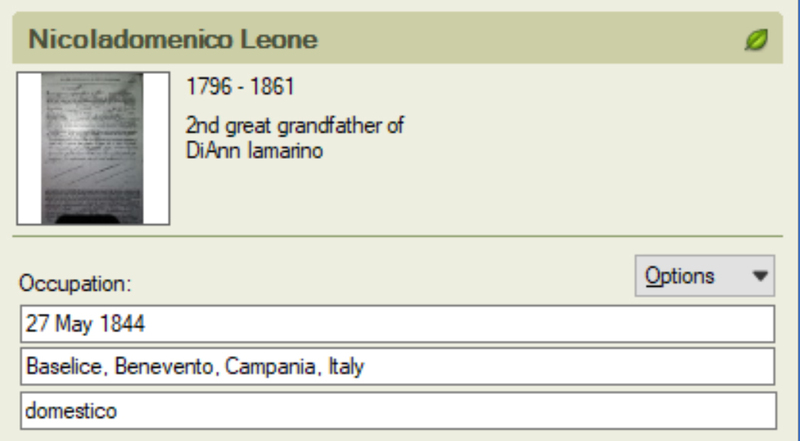 The translation file helped me memorize many words, but I entered only the Italian occupation in my family tree. I felt it made sense for my ancestors who never left Italy. But now I'm thinking more about my family tree as a legacy. If someone else continues my work, these Italian words may not be understood. Wouldn't it be better to include the Italian word and its English translation? Uh oh. How can I make this sweeping change to my tree of more than 19,000 people? I decided to try the Find and Replace feature in Family Tree Maker. It's in the Edit menu. You can use find and replace to makes lots of improvements and corrections. But be careful. Think hard about unintended changes that might happen. For example, if you wanted to replace "Smith" because you found out your ancestors were actually named Smythe, what would happen to your cousin who was born in Smithtown, Long Island? I did a test changing "calzolaio" to "calzolaio (shoemaker)". I checked the boxes to find whole words only and look only in facts and notes. Then I clicked Replace All. Click once, fix 180 entries. Not bad! Now I can work through the most common Italian occupations in my family tree. Then I'll look at some other facts I wish I'd recorded differently. For example, long ago I recorded every immigration fact the same way, beginning with the words, "Arrived aboard the..." followed by the ship name. Later I changed where I put the ship name. Maybe I can use find and replace to bring more uniformity to my facts. It's more useful with the English translation. The lion's share of the people in my family tree were born and died in Italy. I believe in preserving some of their facts in Italian. Aside from occupations, I record the Italian names of the churches where they married. Chiesa di San Leonardo Abate and Chiesa di San Giorgio Martire. Which original-language facts do you want to preserve? How can you prevent that foreign-language information from losing its meaning? Does your family tree software have a find and replace feature?